There’s this spot. It’s on a river. Tough to get to: a long hike in wet grass, a rocky downhill, slipping in mud and stumbling and rolling on loose stones. Poison ivy everywhere. Trail barely visible unless you know where to look. Then you get to the river, where you slip and trip some more, and lots more poison ivy. Most of that is not exaggerated much. You won’t like it, even if I tell you how to get there (and you’ll hate the climb back up at the end of the day). You might see Smallmouth Buffalo and Grass Carp, too. Less visible but catchable are Bowfin, Freshwater Drum, Channel Catfish, Flathead Catfish, Walleye, Sauger, Smallmouth Bass, Largemouth Bass, Mooneye and Goldeye. 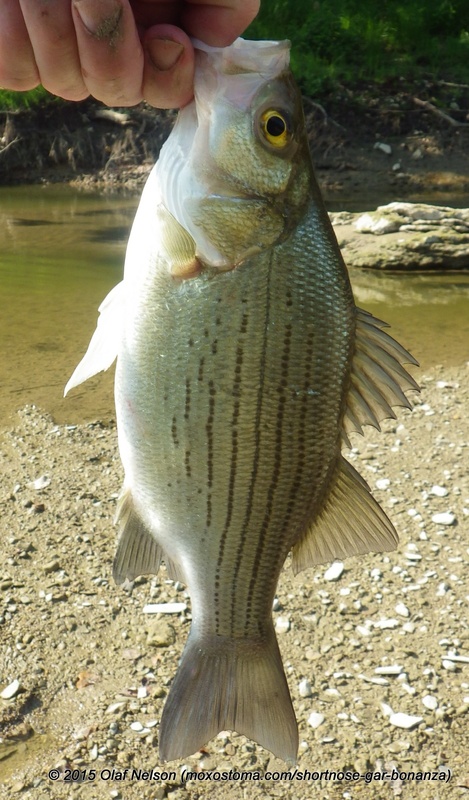 And the White Bass: as aggressive and tenacious as the Shortnoses, and everywhere. I know a guy who caught over 50 of them in 5 hours the other day. I only caught about 20. Unfortunately, Silver Carp and Bighead Carp have moved in over the last few years, and sometimes they’re everywhere. 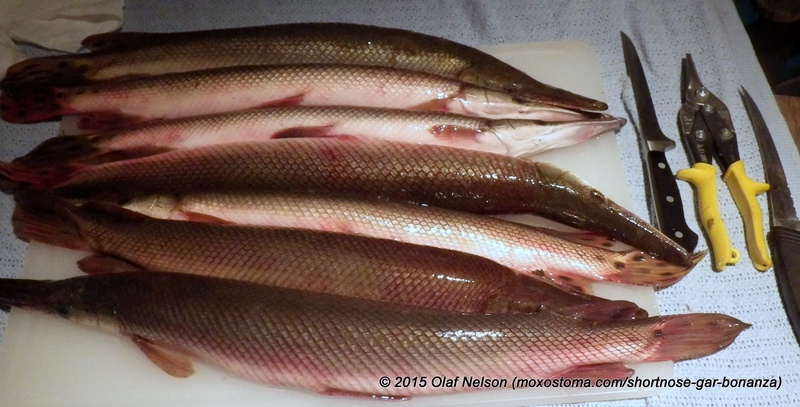 In my experience, when the carp are numerous, the gar are not easy to find and catch. Partly it’s the fact that every cast hits and bounces off multiple carp on the retrieve, often spooking an entire school to jump out of the water (you’ve seen the Silver Carp footage, right?) making it difficult to maintain a winning presentation, but it does seem like the Shortnose population (or at least the number seen and willing to bite) decreases when the carp are there in force. The other day, though, I fished for 5 hours and didn’t see a single carp of any kind. This guy I know said he saw a few Grass Carp, but I didn’t. The gar (and White Bass) were biting like crazy. Getting hits on 5 or more consecutive casts wasn’t even notable. Hooking and landing fish several casts in a row was common. I take a photo of every fish I land so I can get an accurate count at the end of the day, and as I scanned through them later I noticed several series of shots separated by only a minute or two. I had blisters on my hand from setting the hook (or trying), my pants were coated in gar slime and as inflexible as armor when it dried. Hooks that started the day extremely sharp were dull by the end of the day thanks to gar bone and rocks. Two guys fishing, well over 150 fish caught. At least twice that many bites missed or fish lost during the fight. I realized too late that I was using too light a rod, so next time I’ll use something less flexible in order to more immediately communicate my hookset to the hook itself. Since I had the GoPro with me, but not the extension pole or underwater weighted mount, I clamped it to a submerged root and weighted it down with a rock. The water was late-summer dirty and visibility was poor, but I managed to steer a few gar close enough to the camera to be visible. Several gar came home with me to be cleaned, cured with salt and spices, then smoked long and low. 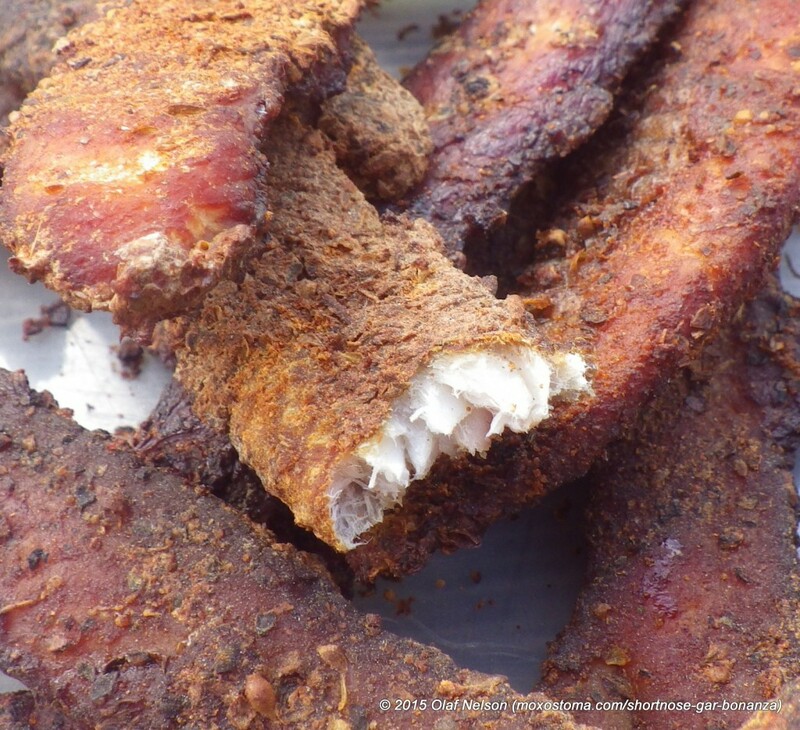 The intent was to make jerky, but the result is excellent, spicy smoked fish, crisp on the outside and smooth inside. Some say that gar meat gets rubbery when cooked, but that must be due to cooking methods as both times I’ve eaten it the result has been delicious. Shortnose Gar. Tin snips are necessary for getting through the armor. Each gar has 2 long fillets down its back. No need to mess with bones or internal organs. 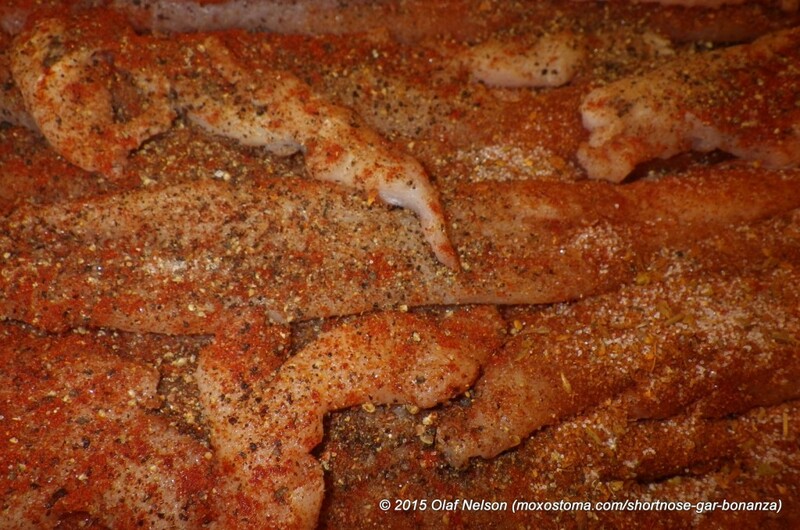 Gar fillets on bed of spices, before being covered by more spices and further layers of meat. Improvised gar rub: salt, crushed peppercorns, crushed mustard seed, salt, various red pepper powders, garlic and onion powders, smoked paprika, etc. 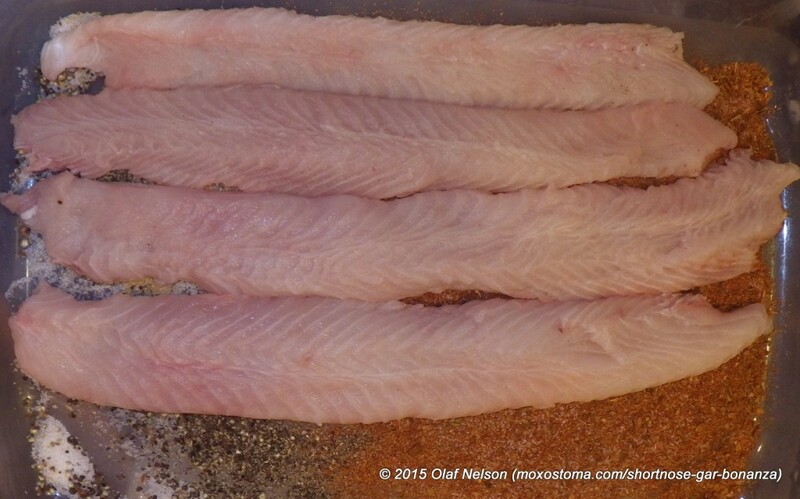 Fully spice-covered gar fillets before 36 hours curing in the fridge. 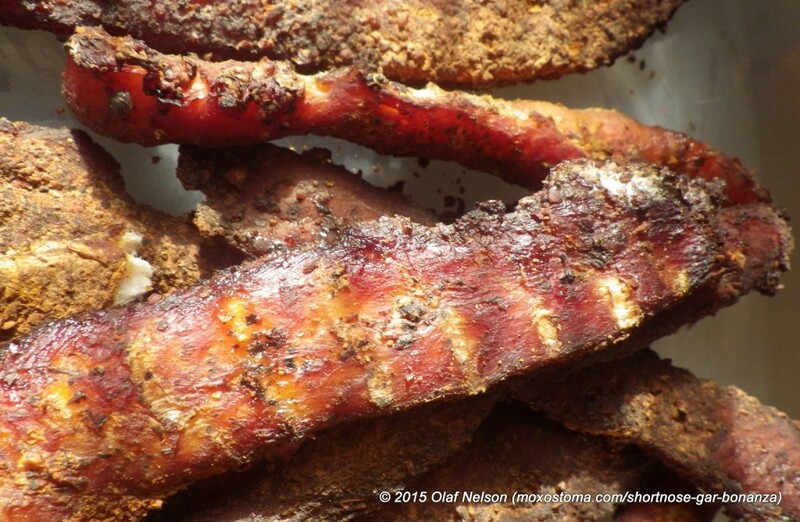 Shortnose Gar “jerky” after several hours in the smoker. 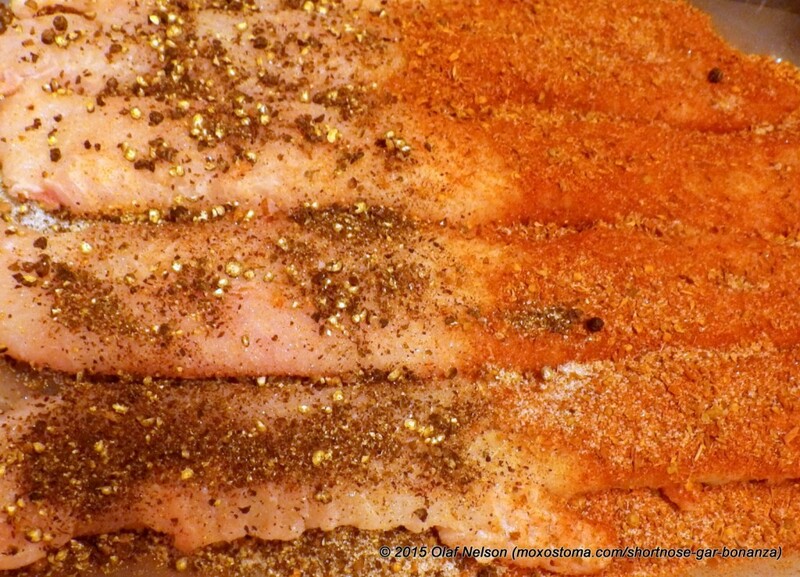 Spice rub and smoke made a great crust. Tagged cooking, fishing, gar, gopro, Illinois, jerky, lepisosteus, photos, platostomus, roughfish, shortnose gar, smoked fish, video, white bass.